Skin Care. 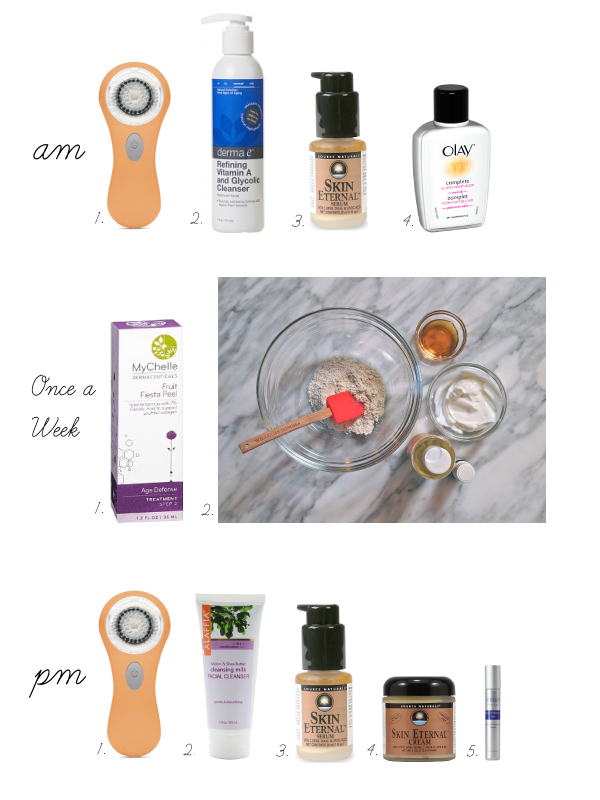 If you know me, you know this: I am a crazy person when it comes to my skincare routine, and turning forty in a few months has only intensified my obsession! Let me start by saying I LOVE my Clarisonic Mia. My skin is so much smoother having added this amazing tool to my day! I use two different cleansers due to the fact that using a glycolic cleanser(no matter the brand) seems to dry my skin, and you can't remove eye makeup with it hence the above gentle PM cleanser. I must confess that I use a few prescription products: a Retin-A and a lightening treatment. Of course, talk to your doctor about these products and if they are right for you:) A must is a weekly facial. It's not only good for the skin but the soul. The mask pictured above is a mask I make myself and I must say the skin glows after! One last word of advice: SUNSCREEN!!! Always. Everyday!!! Have a wonderful weekend and thank you stopping by!